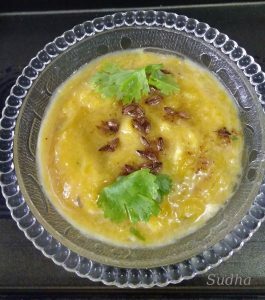 This is a Maharashtrian recipe that uses steamed Pumpkin and curd to make this tasty side dish. It’s a very easy recipe and requires very few ingredients. We have it on fasting day also. If you want to carry it in tiffin, do not mix curd. Carry curd in a separate container and mix it while eating. Some people have it without adding curd as well. That also tastes nice. 1. Peel the pumpkin and cut it into small pieces. 2. Steam cook the cut pumpkin. 3. 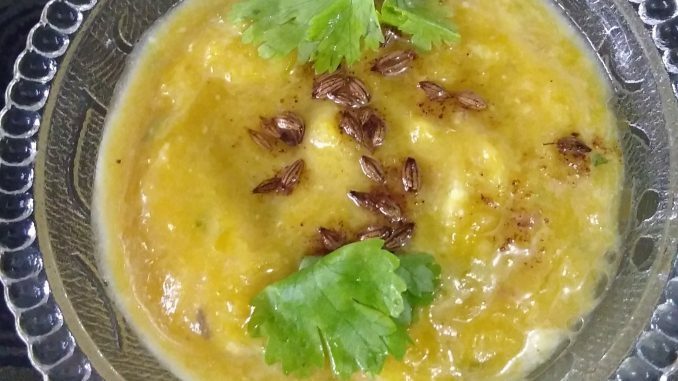 While hot, mash the steamed pumpkin using a spoon. 4. Add roasted peanuts powder, green chilly paste, salt, sugar, scraped coconut and chopped coriander leaves. 4. 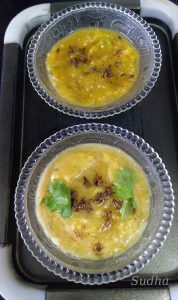 For Tempering, heat pure ghee in a ladle on medium flame. 5. Add cumin seeds (jeera), wait till splutters. 7. Pour this tempering over the pumpkin mixture. Mix well. 8. Before serving add plain yogurt (Dahi / Curd) and mix well. 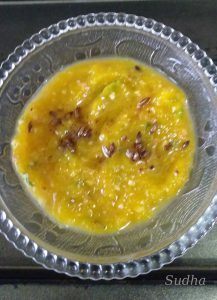 Bharit tastes good without Curd as well. 9. Enjoy with Roti, Rice or as it is.